A/FC - preceded by car number. B/FC - preceded by car number. 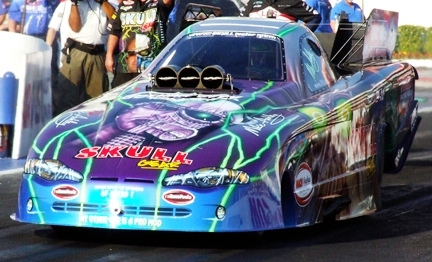 *BODY: Any year funny car body allowed. All styrene bodies must be of a kit based model only. Resin cast bodies allowed. Open holes in front or rear fenders for tire clearance not allowed. Front and rear wheel bubbles allowed. Front wheel bubbles may not be any taller than 1/4", measured from the top of the fender to the top of the wheel bubble. Top may be chopped. Complete removal of top prohibited. Body must retain the full taillight panel. Body width cannot be less than 2" at any point. - Full top hat; styrene, resin or metal allowed. - Blower with "8-port injector injector; styrene, resin or metal allowed. - Injector stacks; styrene, resin, or metal allowed. Top hat, blower or Injectors must be a separate unit; cannot be molded or cast into body. Full top hat: Entire unit must protrude from top body surface. Blower with " 8-port" Injector: 1/4 of blower case must be above top body surface. Injector stacks: Must protrude a minimum of 1/4", measured from top of body surface to top of stacks. *WEIGHT: 100 grams minimum weight. *SPOILERS/REAR WINGS: Permitted; Styrene, resin, or lexan only. "Top fuel" style wings prohibited. Wings cannot be longer than 1", measured from the farthest point of the rear main body to the farthest point of the wing. Cannot be wider than the widest point of the body. No roof mounted spoilers. Front spoiler or diaplane may be used. Must not be longer than 1/4", measured from the main body to the farthest point of spoiler or diaplane. *CHASSIS: Unlimited; ball bearings allowed. *BELLY PAN: Allowed; Must not extend beyond outside of body at any point. *FRONT WHEELS/TIRES: Required; Wheel Hub Diameter 5/8 minimum diameter. *REAR WHEELS/TIRES: Wheel Hub Diameter 5/8, Tire Diameter Minimum diameter 1- 1/16" (1.0625"). Minimum tire tread width fully contacting track surface, 1/2" (0.500") Slitting or grooving of tread area of tires prohibited. *WHEELIE BARS/WHEELS: Permitted; Total length cannot exceed 5" from center line of rear axle to center-line of wheelie wheels. A/FC- ProSlot VR-eXtreme: Part Number PS-4021, ball bearing permitted. B/FC- ProSlot VR-20: Part Number PS-4020, ball bearing permitted. Click Here: For Motor Requirements & Specifications. Click Here: For General Regulations. If there is any area of these rules which needs clarification, please contact Club (.400) Technical Director by e-mail at club400@hotmail.com. CLUB (.400): TAKING HEADS-UP SLOT CAR DRAG RACING TO THE NEXT LEVEL!! � Copyright 2001 - 2018 CLUB (.400) All Rights Reserved.